Throughout the unending pain, failure and lows of life with my life-limiting disease, Bravo programming has sustained me. Bravo reality stars and show producers guided by irony, you have eased my loneliness, made me feel a part of life, and often made me very glad I was too sick and tired to have friends. 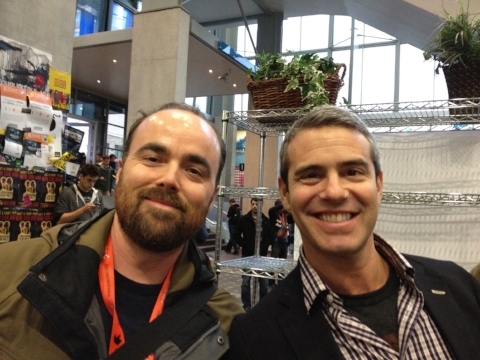 In 2012, Mr. Pennington was at South by Southwest. This was the year before Bravo started broadcasting Watch What Happens Live from there. I was home with pneumonia, as usual. Did not matter because I had too much pain to travel back then, even when I did not have pneumonia. Waiting in line for a taco in the Austin Convention Center, Mr. Pennington had the urge to turn around. He followed his impulse and ... look who was standing behind him: the face of Bravo, the man who hosts the Housewives reunions, Mr. Andy Cohen! Andy!!!!!!! Invite us to the Clubhouse!!!!!!!! No one recognized Andy. Andy looked a little sad. Andy appreciated that Zach asked for a picture. He even said, “Thanks, man.” This totally made my year. Amazing coincidences like these let me know that God is watching over me. I went to Hands On OT to get some advice on preventing damage to my flimsy hands. My small joints are especially loose. I also went to Hands On OT because Gigi from Shahs of Sunset came there for hand therapy. Paul (pictured below) is an occupational therapist. His wife is Japanese. He would speak to me in Japanese. I would stare back at him blankly. I was only the second marfanoid patient that Paul had ever seen. Where are all of my people? You need to be here, too. At Hands on OT, they saw mostly hand and arm injuries. Paul had a lot to teach me about saving wear and tear on my hands, to make those joints last as long as possible. This has been my philosophy with my spine, knees and hips. I just had no idea how to do this with my hands. I was grateful for the education. We practiced picking things up, putting them down, opening things, closing things, turning things on and off, tying things. It was very elementary school. I had a great time. Paul tried to figure out a way for me to draw my shots and give them to myself without straining my hands. Those giant syringes of syrupy antiscorbutic acid at a concentration of 500 mg per ml are a bit difficult to manage. Paul showed me how best to depress the syringe. Then we permanently assigned the task of drawing the shots to Mr. Pennington because that is the hardest part. The other patients sure wanted to know what I inject. We had a good laugh that day. Paul showed me all sorts of adaptability tools. This handicapped fork does make eating daikon kimchi easier. Who wants to take me to fine dining? I might whip these out from my Hermès Kelly bag of dubious authenticity. Eat your Kimchi! Martina has Ehlers-Danlos, too! I love that podcast. Can I come visit you guys in Japan? Just a bit short for my long spider fingers. A big fat pen Paul set me up with. Wish it were longer for my marfan hands, but I take what I can get. It sure is easier to operate than a normal pen. Just like the fat fork. Just a bit short for me. My hand is huge. Growing up undiagnosed, writing in school was so hard, I did not bother taking many notes. I had bigger concerns. Staying upright was enough of a challenge, as was struggling with my backpack across school. Wow, were those chairs in school uncomfortable, at least for me. My brain was getting fried from all the pain signals coming back to it, which had started surging when I was 14 or so. My attention was in and out (mostly out) from dysautonomic crashing. I was always freezing cold. Most days I wore a turtleneck and giant sweater - in Los Angeles. It was quite a look. Adolescence is a particularly un-fun time to have Ehlers-Danlos Syndrome. Paying attention is an activity for healthy kids, not this sick girl. With so much distraction, I became good at creatively figuring things out on my own, rather than taking notes or paying attention or caring what authority figures think. Did not have time to care much about peer approval either. Nothing builds endurance like surviving with Ehlers-Danlos Syndrome. These are all skills that have served me well, although I would prefer to have been born able to produce proper collagen. Paul suggested we make changes in our house to make life easier on my hands. Why? So I do not wear out my precious hands. I want to be able to put on my own jewelry and eyeliner until the day I die. I’m more than happy happy to implement conservative measures now. Rely on big joints and big muscles to do the hard work, like opening the refrigerator. Burns more calories, opening fridge like this. I learned to use dictation software on my phone and on the iMac at home. Here I am in drawing class at my favorite place, the Norton Simon Museum. I am practicing relaxing my arachnodactyly (spider fingers), just like Paul taught me. It is important to perform tasks with appropriate levels of tension and strength but not strain. It was hard work, learning to relax my hands while I use them. I broke down sobbing in drawing class in the garden of the Norton Simon on another day. It was truly embarrassing. I could not stop crying. I stopped trying to draw. I had not realized how much my hands had frustrated me all my life. It was hard to notice with the rest of my invisible and confusing limitations. No hope for me as a fine artist. I’ll stick to selfies. I’m not really trying to draw. With these hands, success in drawing is not my destiny. I suppose that modern art would be my only choice as a fine artist. I go to modern art exhibits to make fun of them. Hey, even I can draw this with my marfan hands! What is this doing in a museum? The Broad. Making fun of the art. Most of it there is ridiculous. I dislike modern art, mostly because it says nothing and does not move me and is amateurish in execution. However, I visited the Centre Pompidou in Paris this summer (I wrote this post before that trip) and had a deeply moving experience with the modern art there. My opinion on the subject was reformed. View from the Centre Pompidou. Art. Do you have anything to say? Wish I were there now. Back in Los Angeles after all the art I experienced in Paris, I thought I would like the art the Broad better. Nope. Most of the art there is simply objectively offensively ridiculous. But the Japanese art at the Broad is superb. May I take this home? Across the street from the Broad at Blue Cow, I do enjoy drinking the Not So Old Fashioned, holding the glass just like Paul taught me. “Two hands, gentle use of thumbs. Preserve your joints,” says Paul. That is an excellent drink. Really good food there, too.